Onyx Path Publishing: Many Worlds. One Path. Important news, releases, upcoming Kickstarters, etc. 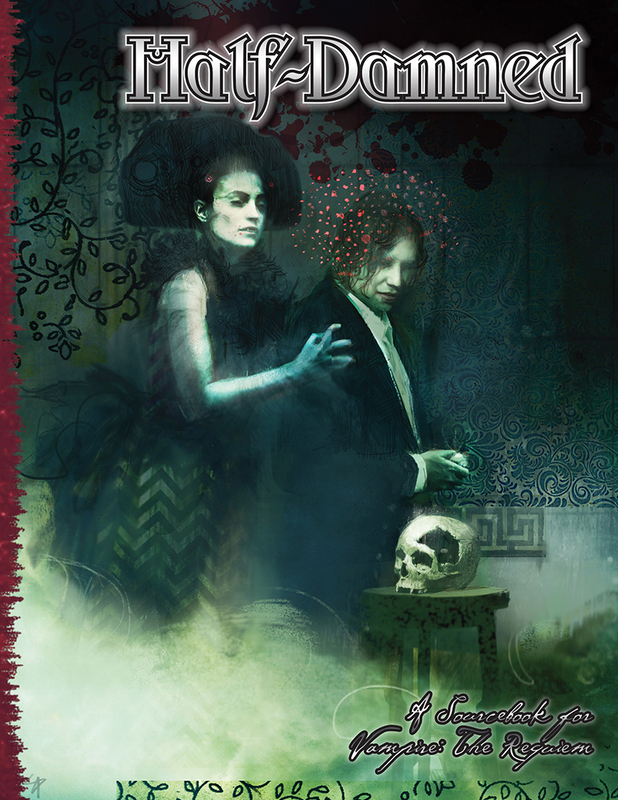 Now Available: Half-Damned, 100 Devils part 7, and more! Now available from DriveThruRPG as Advance PDF: Half-Damned for Vampire: The Requiem 2nd Edition! My mother would show up every few years and suddenly be very into my life. but she never really listened to me when I tried to talk to her. I’d meet these people, all weird, all terrible, and then she’d be gone again. To say that I resent her is an understatement. I love her, she’s family, but I don’t love what she is. An exploration of what it means to be one of the Half-Damned, dhampir, revenants or ghouls. Mechanics for creating Half-Damned characters. Information for creating and running chronicles using the various Half-Damned character types, both with vampires and alone. Information on Half-Damned antagonists for vampire chronicles. 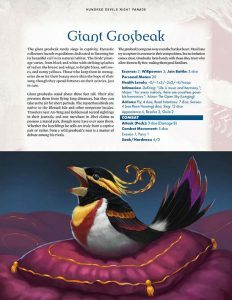 Also available in PDF, part 7 of our ongoing Hundred Devils Night Parade series: Bloodworm and Giant Grosbeak! 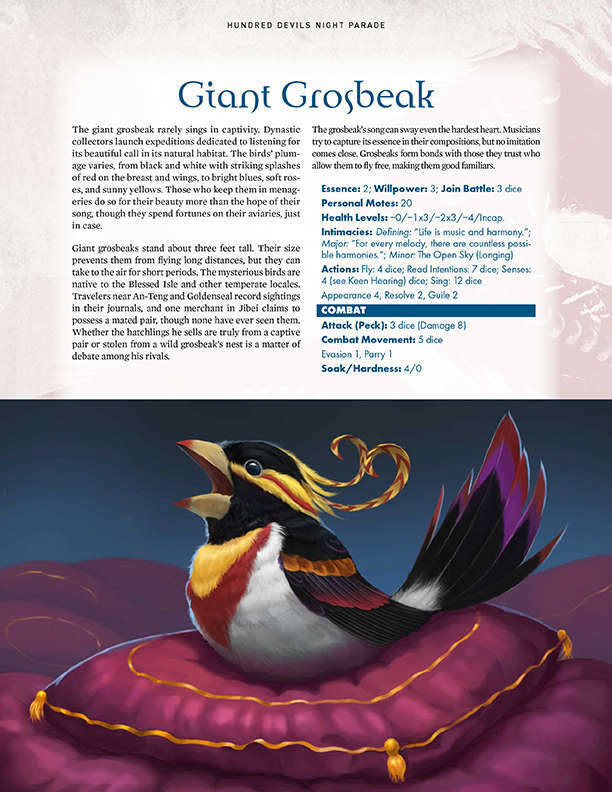 The revolting Bloodworms and the exotic Giant Grosbeak are fantastic additions to your Exalted game. Reminder that the Onyx Dice dice app is still available for iOS and Android! The last two weeks have brought us app updates based on your feature requests, so this is a continuously evolving product. There are no updates this week, as the app crew are working on some big stuff which requires a bit more time to accomplish. If you’ve used it and enjoy it, please leave a comment and a rating in the app store! Has the Wraith the Oblivion 1st edition been rescanned for the print release? I remember the scan from a few years back being fairly bad in terms readability. Yes, this was a rescan of the book to make a better looking PDF and PoD. Does the new print of Wraith 1st have the features of the original cover (glow in the dark) and does it have the errata? Glow in the dark is not available in Print on Demand. It is just a scan of the previously printed book. This doesn’t get said enough, but you do the Lord’s work, Jessica. Copyright © 2012-2015 Onyx Path Publishing, LLC.